The Co-permittees in the Santa Margarita Watershed Management Area (WMA) work cooperatively to implement the requirements of the Regional MS4 Permit (Order No. R9-2013-0001, as amended by R9-2015-0001 and R9-2015-0100) issued by the California Regional Water Quality Control Board, San Diego Region. This clearinghouse provides public access to all of the plans, reports, maps, and supporting information required to implement the Regional MS4 Permit. 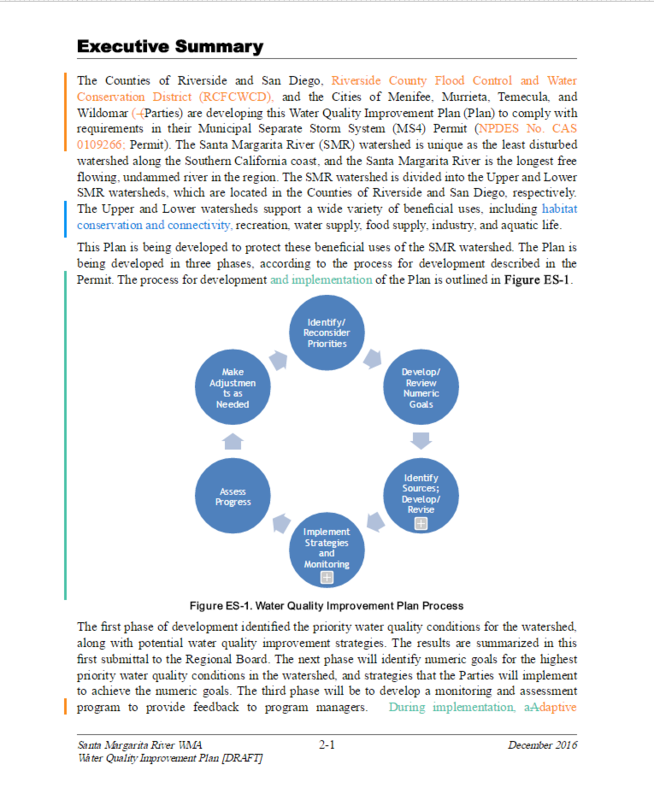 The Water Quality Improvement Plan (WQIP) is the overarching watershed plan, whereas the Jurisdictional Runoff Management Program (JRMP) documents provide more details regarding implementation. together to create a WQIP which allows them to address both regional and jurisdictional water quality improvement goals. As required by the San Diego Regional Municipal Stormwater NPDES Permit, all new and resubmittals of WQMPs shall use the 2018 WQMP Manual. All previous WQMP versions are no longer in effect. For more information please contact Matt Yeager at (951) 955-0843 or MYeager@Rivco.org. Notification: Using the link below, request to be notified of key WQIP development milestones and activities. Notices will principally include upcoming meetings and availability of documents for review. Participation: Participate in calls for data and the formulation of objectives and approaches. There will be a minimum of 2 calls for data. Consultation: A Consultation Panel (i.e., Consultation Committee) was formed to specifically seek the opinions of key interested and affected groups to guide the development of a comprehensive WQIP. The posted WQIP documents are DRAFTs and not yet finalized. The most recent draft of the WQIP was submitted to the San Diego Water Board on January 5, 2018 and is currently under review.